A part of Middle LaHave seen from across the river. 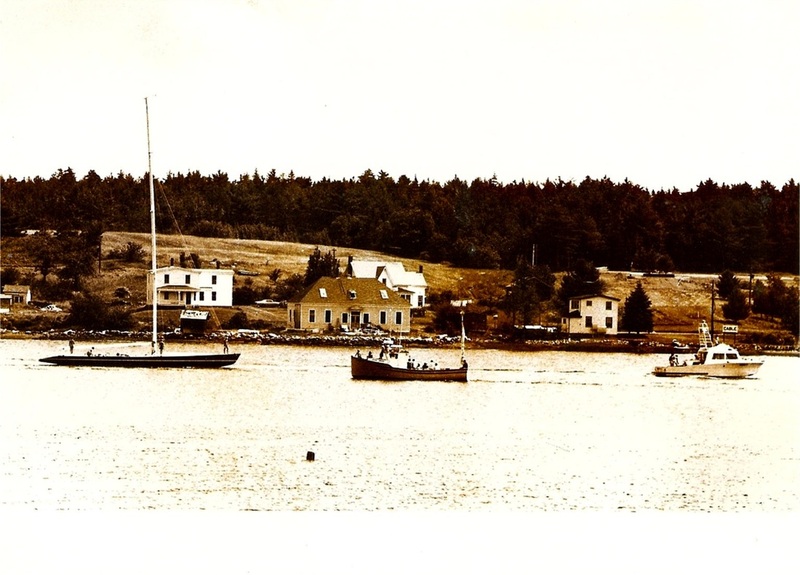 Middle LaHave in Lunenburg County, Nova Scotia was my home and where I lived for thirty years until I moved to Halifax. I have added this page to my web site to include some information on this community. 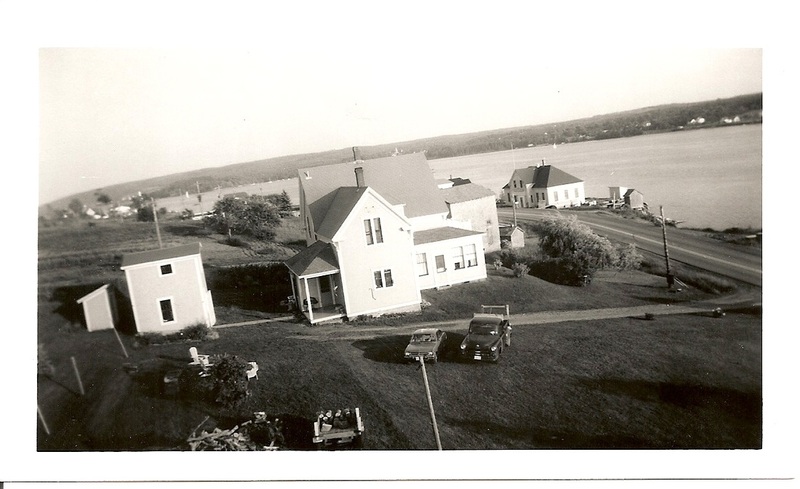 My Corkum ancestors emigrated from Germany (originally from Holland) to Halifax in 1752 and settled in Lunenburg in 1753. Original probate records show that my Great (x5) Grandfather Johann Wilhelm Gorkum was granted a town lot in Lunenburg (black arrow) on the block just above the present day Zion Lutheran Church, a "garden" lot somewhere in present day Garden Lots (purple arrow) outside Lunenburg, a 30-acre farm lot in Division "South E-1" which is in present day Feltzen South (red arrow), and a 300-acre lot in "First Division E-3" just above the small lake on the map which is in present day Oak Hill (green arrow) outside Bridgewater. One can imagine it would take some time in those days to travel from town to the 30 and 300-acre lots. Middle LaHave is shown by the blue arrow. 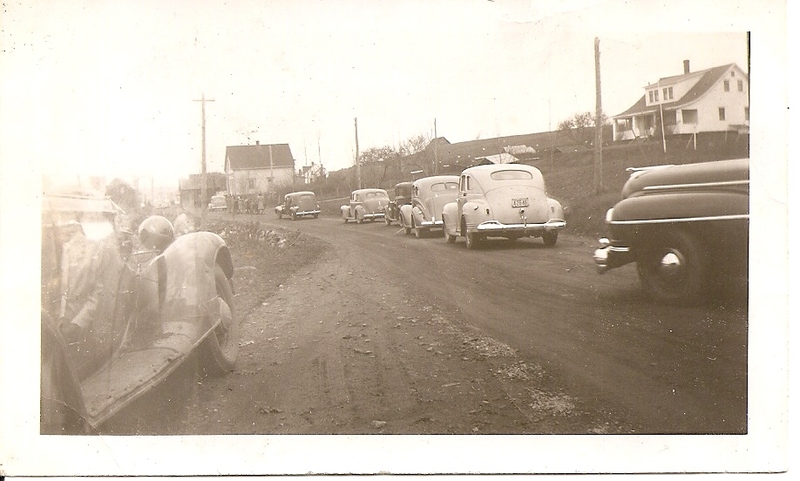 At this time I do not know when our first ancestors settled in Middle LaHave. This map was drawn by J. Christopher Young in his 2003 book "Maps Associated With Lunenburg County Family History." 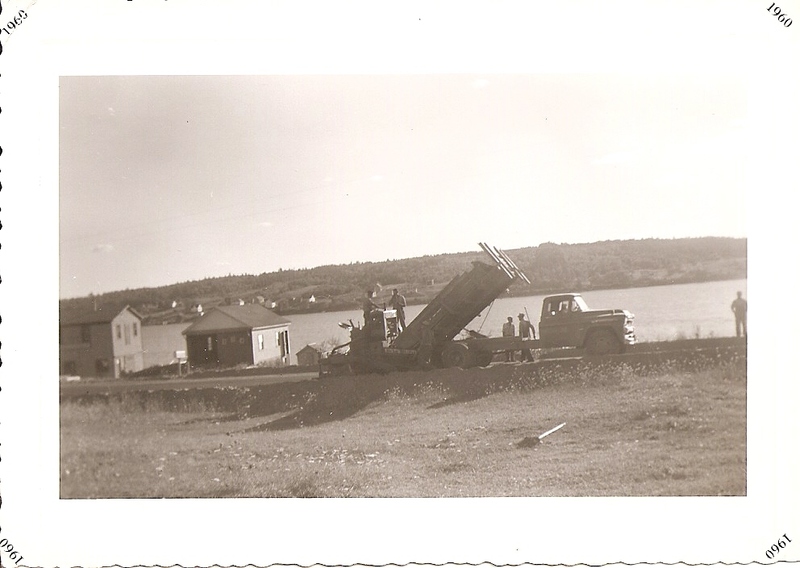 he following transcript is from "Place-Names and Places of Nova Scotia" published by the Public Archives of Nova Scotia in 1967 and a searchable database can be found on their web site here. There are 751 pages and Middle LaHave is on page 432. "It is on the outside of the LaHave River and about four miles from it's mouth. This place was originally called East La Have Ferry because of the ferry service which operated there. The name was probably changed about 1916. "Tobias Berringer, John Froelig, Rev. 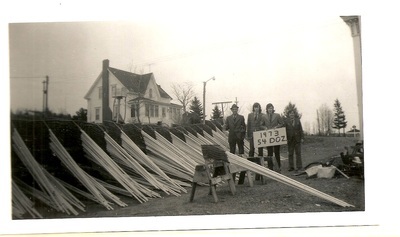 Roger Aitken were original landowners and settlers. 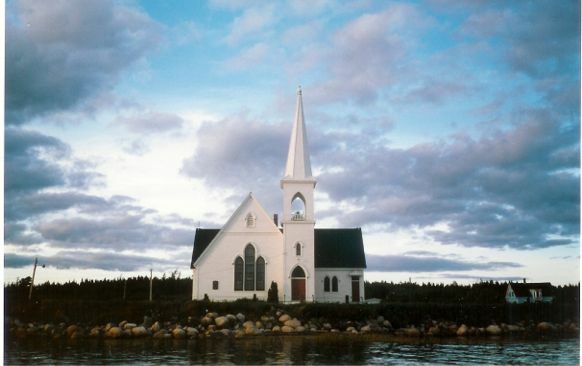 "St. Bartholomews Anglican Church was built in 1836, and consecrated in January, 1848. A Union Church for Lutherans and Presbyterians was built in 1870. St. John's United Church was built in 1901. 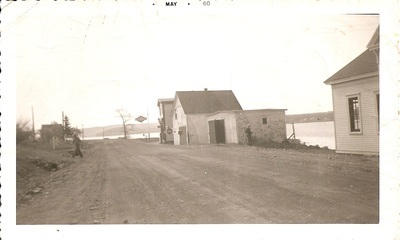 "A school-house was built at "LaHave Ferry" sometime between 1864 and 1872. 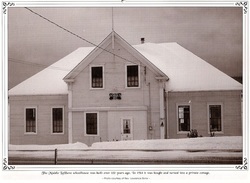 A new school was built in 1902. "A Postal way office was opened at Middle LaHave Ferry in 1859. "Fishing and some farming are carried on as industries. "Population in 1956 was 161." 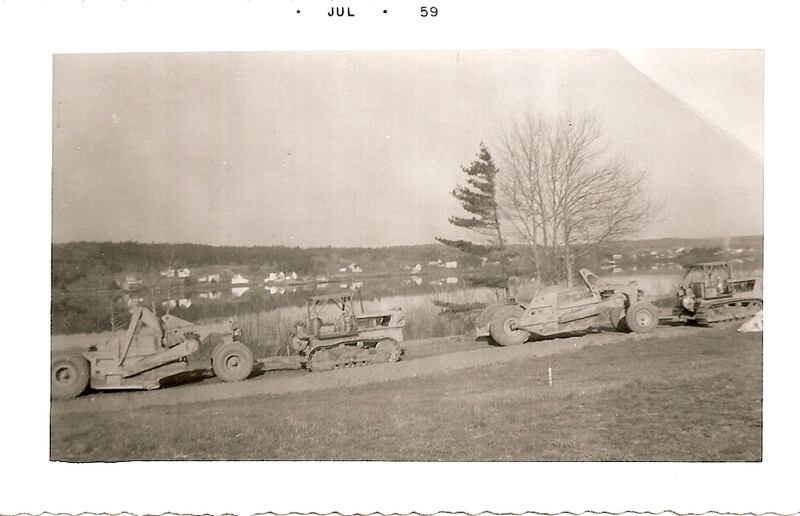 Click here to view a history of Middle LaHave as printed in the local newspaper in 1948. Watch the video below for a short three minute travelogue through Middle LaHave. 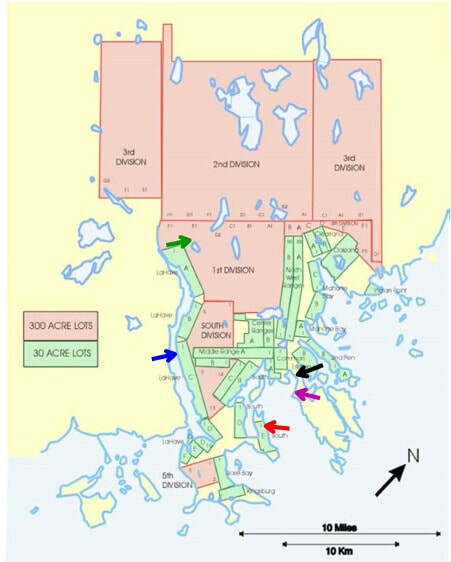 Here's a map - most of the community is shown here along the east side of the LaHave river. The red line is the main road, the two brown lines are other roads. 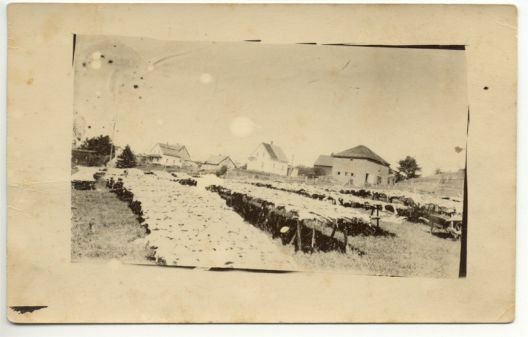 The procedure for curing cod fish into "salt dried cod" is explained on this web site about the Maine fishery which would be very similar to the procedure used in the Lunenburg Grand Banks schooner fishery. Off picture to the left of the "flakes" by the river was the family's fish shed. My father later converted it into his carpenter shop seen in the aerial picture below - the white building at the upper left edge of the picture with the small shed attached. The flakes above were spread out on the field to the right of the building next to the road. 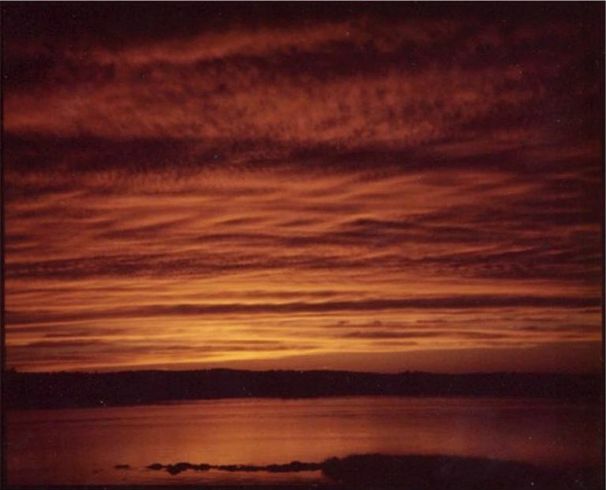 Below are two sunsets that I captured from my home sometime in the 1970's. 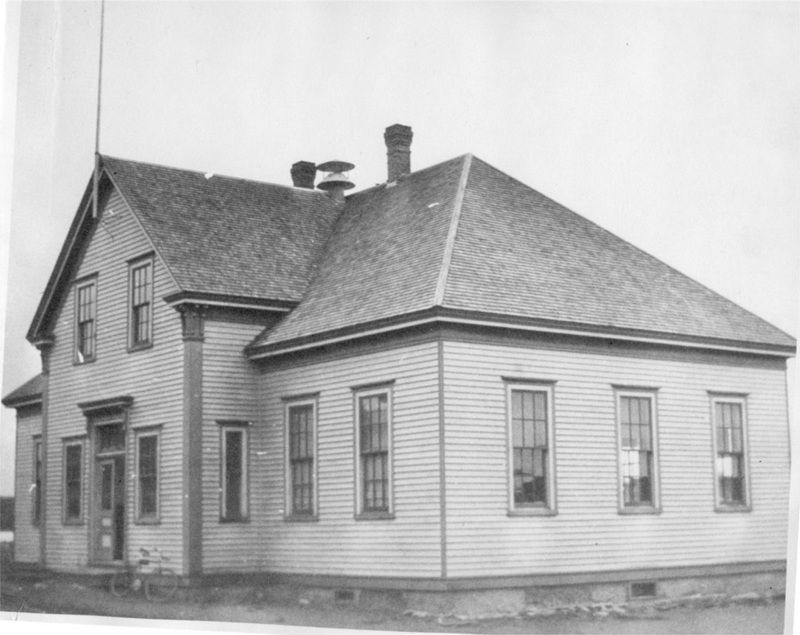 The Middle LaHave School as it looked while still in use (above.) It was closed in 1958. It was two rooms, the elementary grades primary to six on the right and the high school grades seven to twelve on the left. I attended my first two years (1956-57 and 1957-58). That was very convenient as I lived just two houses away! 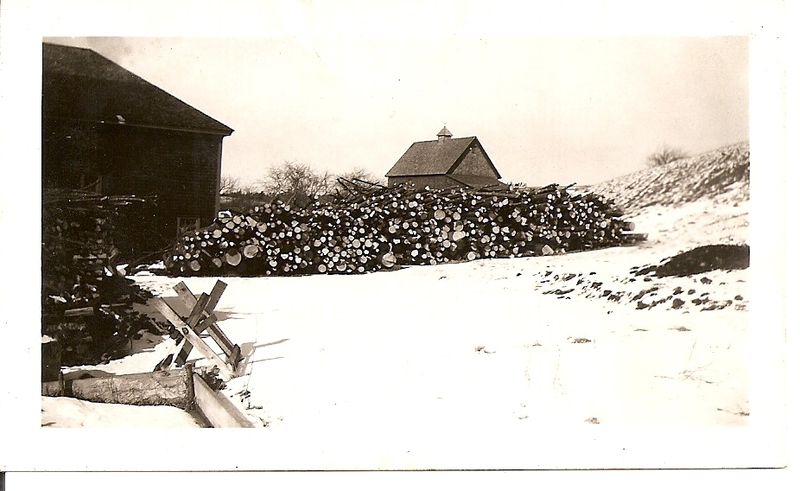 It was heated in winter by a coal stove in the middle of each room and the older boys would carry buckets of coal from a coal storage shed. 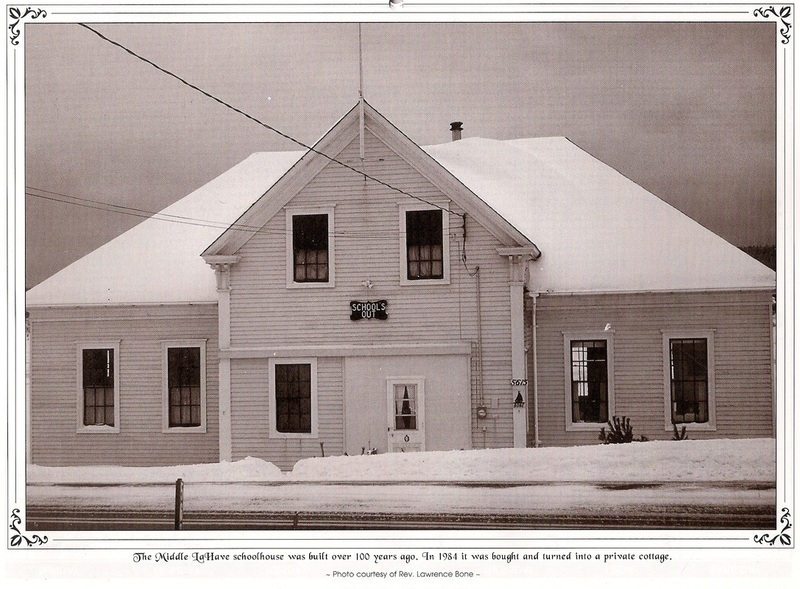 The old shed can still be seen in the aerial picture below at the upper left corner of the school. 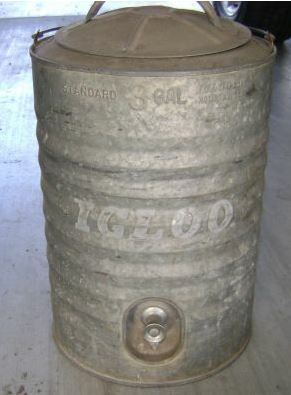 Drinking water was stored in a metal "cooler" (something similar to the example in the picture below left) and the older boys would fetch a bucket of water when needed from the well of the house across the road. Bathroom facilities consisted of a "three-room" outhouse behind the school. When the school was closed it was sold to my father who used it for a carpenter workshop for approximately fifteen years. The school is located on a small piece of land along the river. The deed stated the property to be "half an acre, more or less" and my father used to joke that it was "more when the tide was low and less when the tide was high!" In the pictures below, the center picture (taken from the roof of our barn) shows the school in the distance at the right. If you click on the picture to enlarge it, you can see more of the property and the outhouse with the sloped roof and the coal shed to the right of the school. I don't know the date of the picture but some time in the 1960's as it was the workshop at that time. 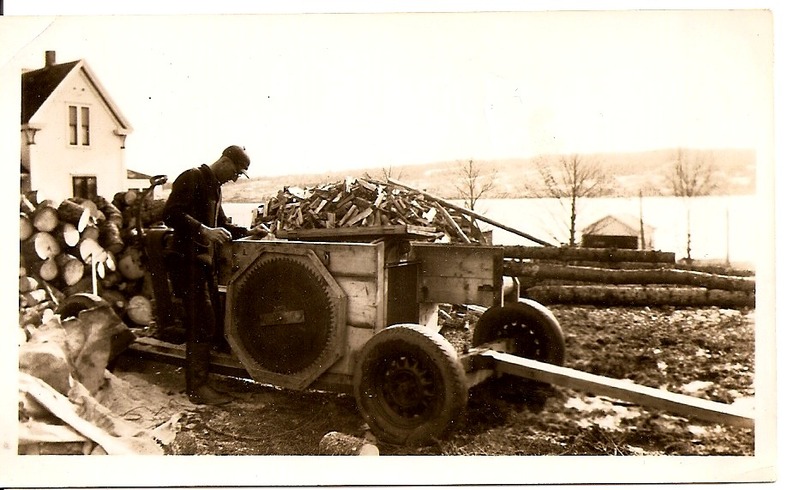 When my father purchased it he removed the interior walls and the left chimney to make it functional as a work shop. The original entrance was removed and replaced with a large sliding door to move materials in and out, with a standard entrance door in the middle of the sliding door. Otherwise the interior remained as it was with the original paint color on the plaster and the blackboards on the walls. After my father passed away, it was sold and for a time was a boat shop (with a large door cut into the north side) and then eventually became a residence in 1984. A reunion was held August 23, 2003. 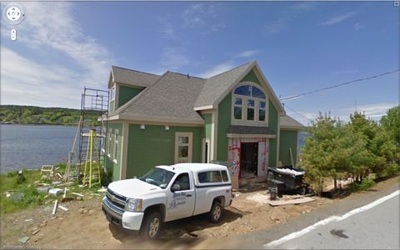 It was again sold in 2009 and the new owners at that time made major renovations including the exterior as you can see from the picture below right. Here's an interesting picture. 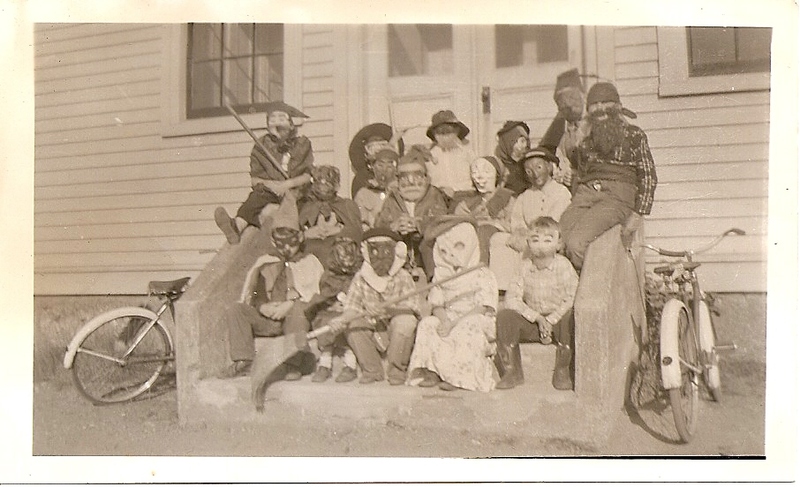 This is a Halloween party at school (undated) and it was taken on the back steps. 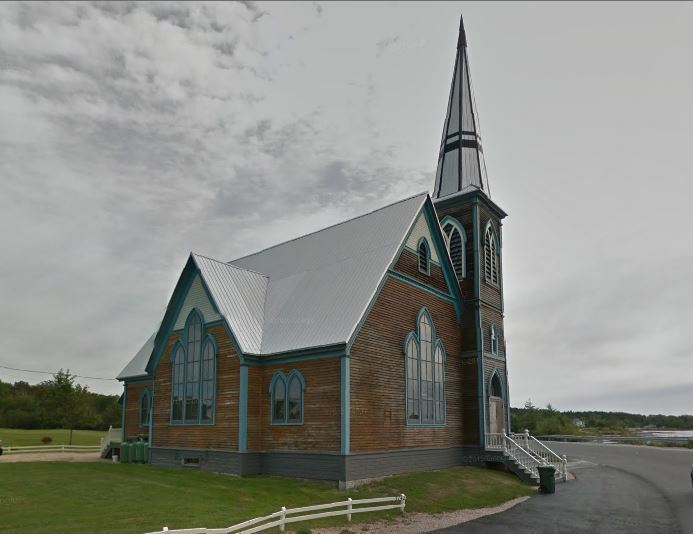 St. John's United Church is the first of three churches in the community heading south along the highway (and the only one still operating.) A bit farther along the highway is St. Bartholomew's Anglican Church which is the oldest church along the river. Unfortunately this church has now closed in 2016 - see news article here. 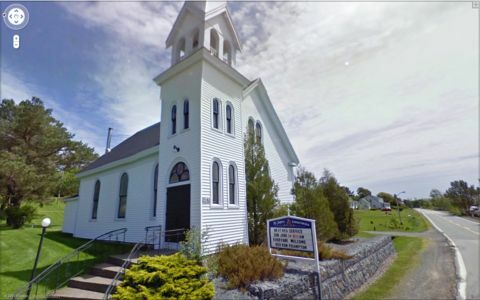 Finally the last church at the southern border of Middle LaHave was St. Mark's Lutheran Church. This is the largest building however due to declining membership, the congregation disbanded and the church was closed in 2005. This was the church as it looked at the time it closed. This was the church I attended. The church was later sold and renovated by the new owner - see his web site at www.stmarksplace.net. Here's a picture from the river showing a portion of Middle LaHave with the school in the center. 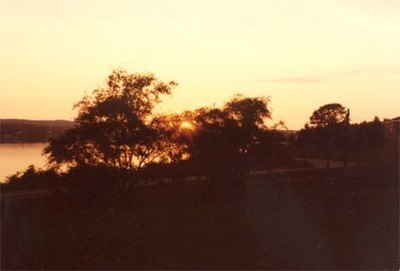 Not sure of the exact date but I believe it may have been around 1984 or shortly after while the building was being used as a cottage and you can see some skylights had been added on the roof. Here are some pictures from 1959 when the main road was paved. 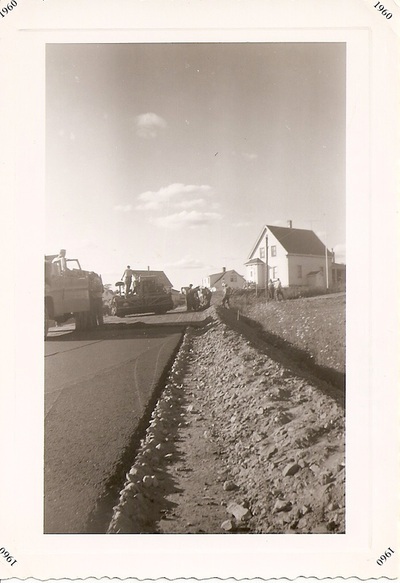 In a rural area, a paving project was a big thing back then as many roads were still dirt. 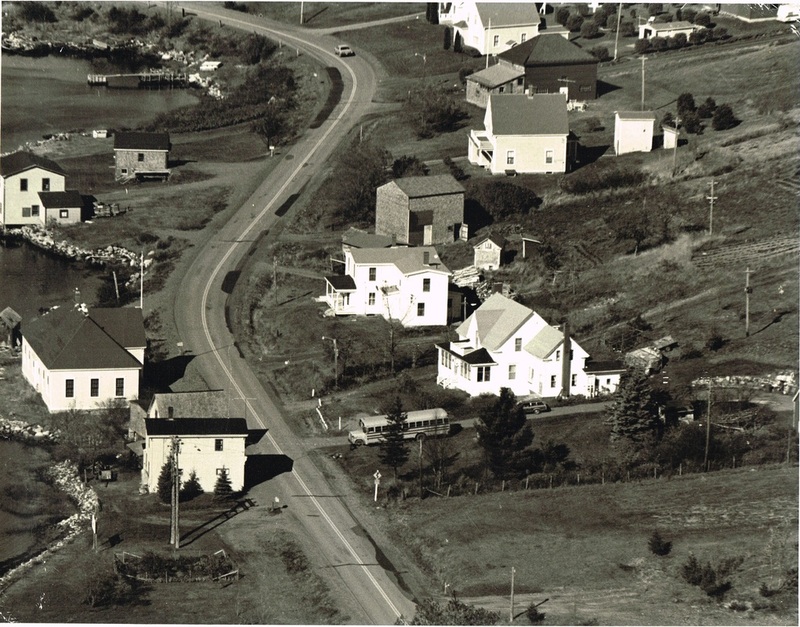 The location was along the section of road in the above picture. A few more miscellaneous pictures below. 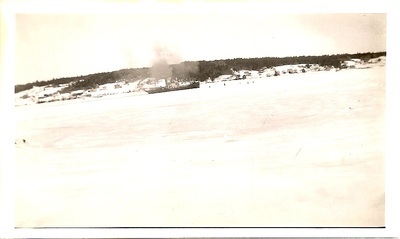 On the left, is a loaded timber freighter heading down river. 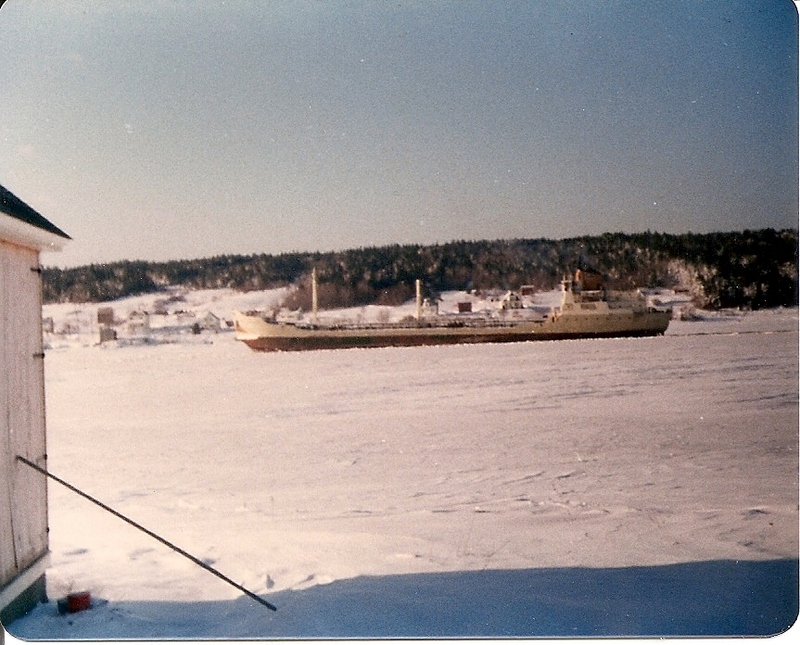 Years ago, freighters would come up river to Bridgewater to load timber. In the center is a oil tanker (probably Irving) also heading down river. 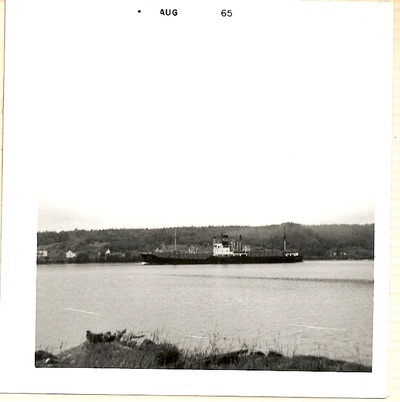 Irving used to have a tank farm in Bridgewater and tankers would come up river to unload. In the winter the river would freeze over with ice and when a tanker or freighter was due, an ice breaker would first have to go up river to open a channel in the ice. 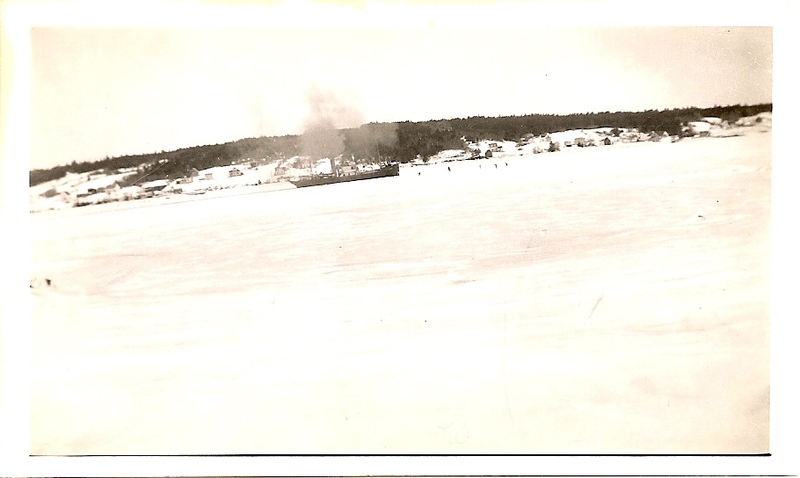 On the right is an older picture - I'm not sure what type of ship that is, I suspect it might be an ice breaker opening a channel up river - but notice the small black spots to the right of the ship - that would be some curious bystanders out on the ice to watch the progress. When I was growing up, the river would freeze over almost every winter. We would skate and play hockey on the ice, and we would walk across the river to visit people on the other side. 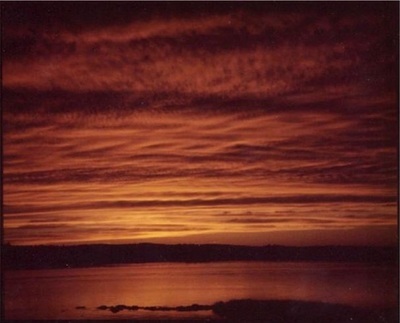 (We would row across in the summer.) We estimated it to be about a mile across here. There were stories of people actually driving cars on the ice many years ago. 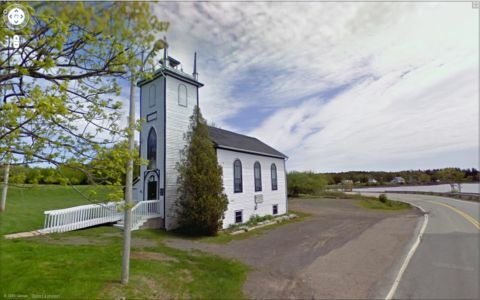 In fact, the old Union Church building (predecessor to St. Mark's Lutheran Church between 1864 and 1901) was moved from Middle LaHave to Bridgewater pulled by ox teams over the ice in the river not long after it was closed. So you can imagine that the ice on the river would have been frozen quite thick in those days. Our winters must be warmer today as the river does not freeze over anymore until you get close to Bridgewater. 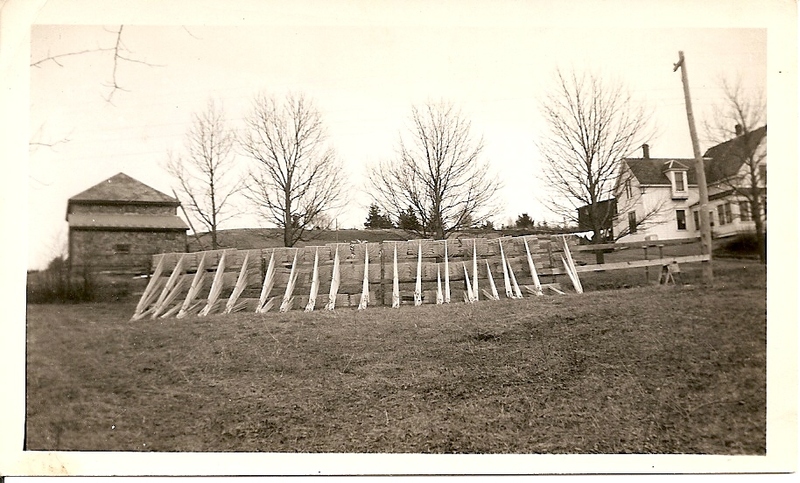 In the early days before a lot of mechanization on farms, some of the hay would be raked by hand. When carpentry business was slow in the winter he would spend the time in the workshop manufacturing wood hay rakes. When my brothers and I were old enough to help in the workshop that's where we would often be found - it was a lot of labour to make a hay rake. I can still remember all the many steps involved in the assembly line process. 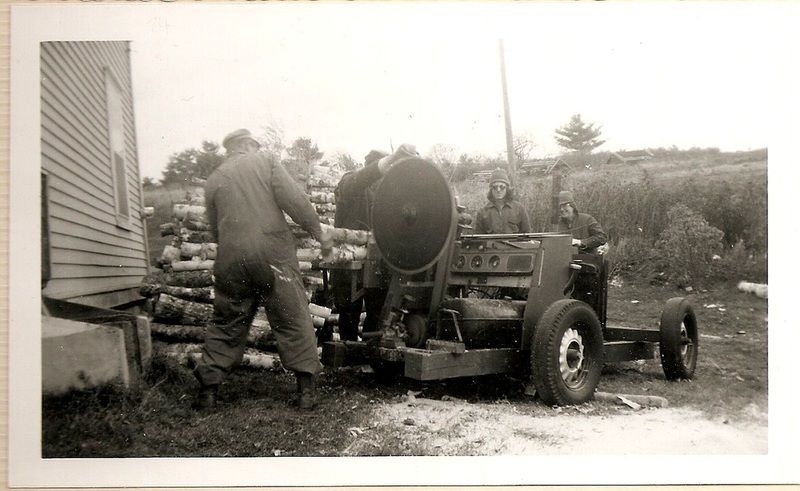 In the spring he would sell them to wholesalers who would distribute to the farm supply stores. In the picture at left (sometime in the 1950's) you can see them all stacked ready for spray painting bright red (I count 50 dozen.) In the center picture (1968) they are now finished. 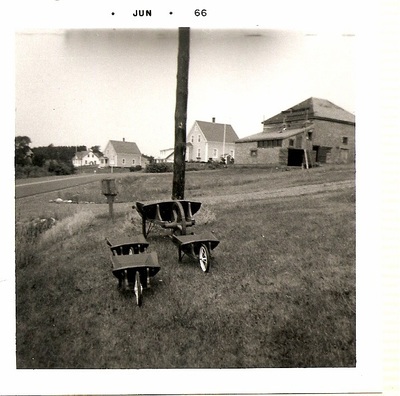 Notice there are three wheelbarrows also in that picture. 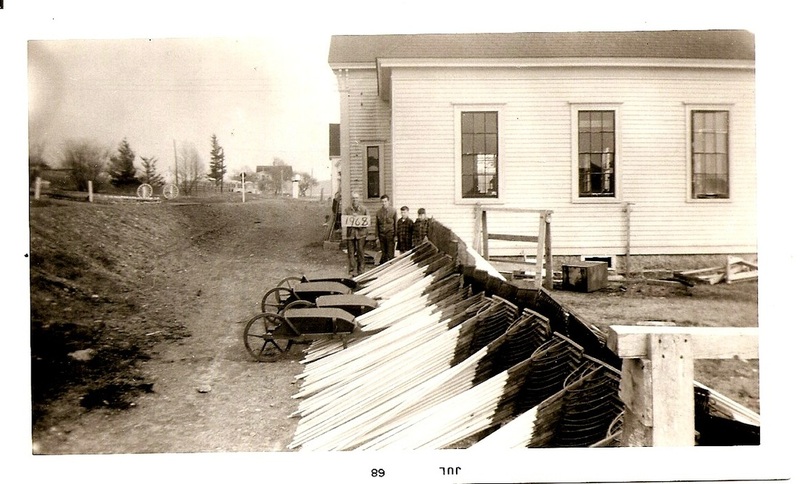 At one time he received an order from someone to make some very large rakes. I do not remember what the purpose was but they were very much bigger than these normal hay rakes. At another time he was approached by a businessman who had the idea of selling rakes to tourists. His idea was that they would be painted different colours and there would be designs painted along the top of the rake heads to represent various regions. One sample was painted blue with red lobsters, another was painted a pastel yellow with red cherries. However there were some problems that could not be overcome. A rake has a handle that is 6 feet long - you can't easily put one of those in your car trunk or check it as luggage on a plane! 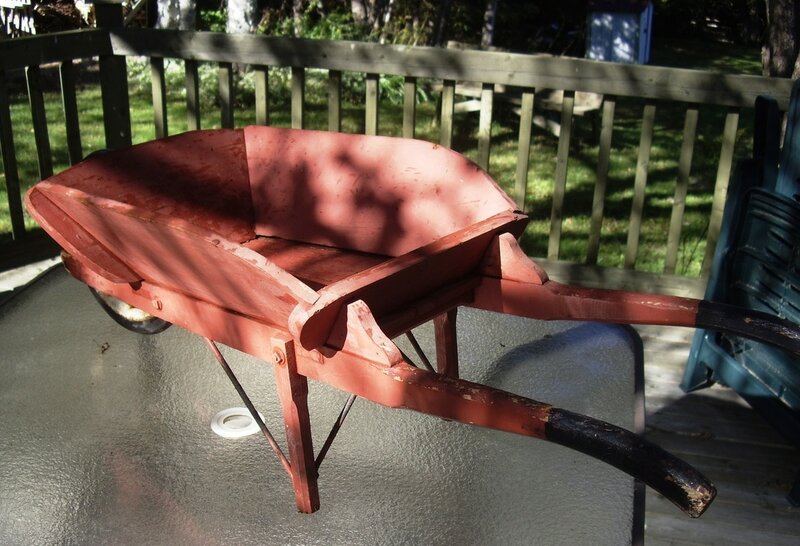 He experimented with some way to cut the handle into three shorter pieces to be packaged with the rake head in a triangular shaped box and reassembled once the purchaser had gotten it home. However each solution tried resulted in serious weakening of the handle at the joints so the project was abandoned. In addition to hay rakes, he also made some wood wheelbarrows. 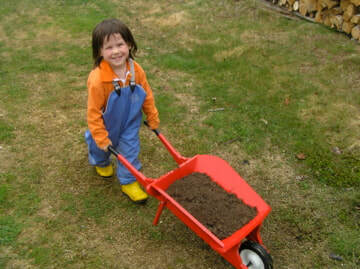 I still use one of them - see picture below. 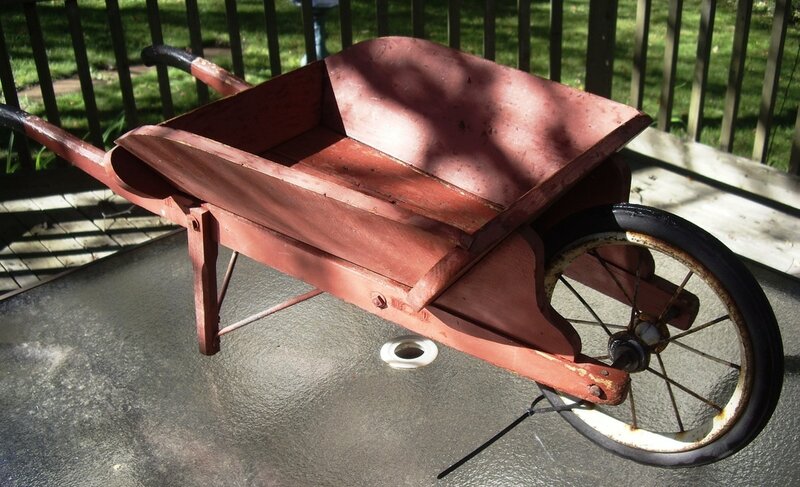 They were well built - oak handles and wheel with iron tire, and pine box with removable sides - and while heavy (definitely a man's wheelbarrow) they were very stable with the slightly downward curved frame and was easy to push heavy loads with the large narrow wheel (assuming you were not going uphill.) Toward the end of production it was very difficult to find a blacksmith with the skill to put the iron tire on the wood wheel properly - the blacksmith needed to know exactly how big to make the ring of iron so that when heated it would expand enough to slip on over the wood wheel and shrink enough when cool to be a nice tight fit. ​He also made a child's size version as a toy. I still have mine that he made in the early 50's - bottom left and middle pictures below. 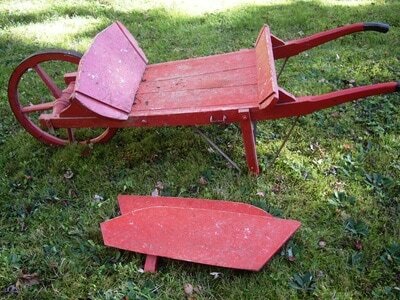 It's showing some wear and a little rust on the wheel but still in good condition after being in storage for 60 years! 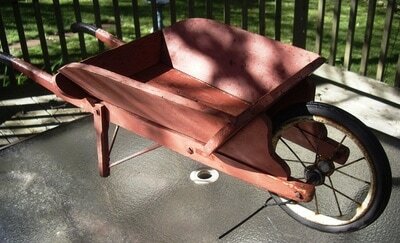 I made a few myself in later years but they were difficult to sell at a practical price. The child in the bottom right picture has the last one I made (and he's definitely enjoying it). ​You couldn't make any of these products today to sell (rakes or wheelbarrows) - material cost and labour time would make them too expensive. Never mind what it would cost to ship anywhere! History of the County of Lunenburg - Written by Judge Mather Byles DesBrisay, second edition published 1895. This is a very comprehensive book about the county at that time. I have a copy that was reprinted some years ago.